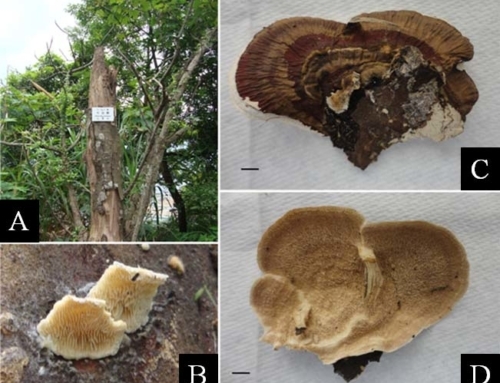 Fruiting bodies up to 9.0 cm in height, pleurotoid; pilei up to 10.5 cm in diameter, depressed, surface grayish brown bearing brownish to purplish squamules, dry, fleshy, flesh up to 0.3 cm thick, white, lamellae yellowish white, decurrent, extending down on to the stipe, subdistant (up to 0.4 cm apart from each other), unequal, divided into two tiers, ventricose, gill edges wavy, spore print white; stipe 4.5 to 6.5 cm long, 2.2 to 3 cm broad, grayish brown, lateral, tapering downwards, solid, flesh white underneath; basidia 33.0-50.0  5.0-8.3 μm; spores 8.5-14.5  4.5-6.64 μm, oblong, elliptical, inamyloid. 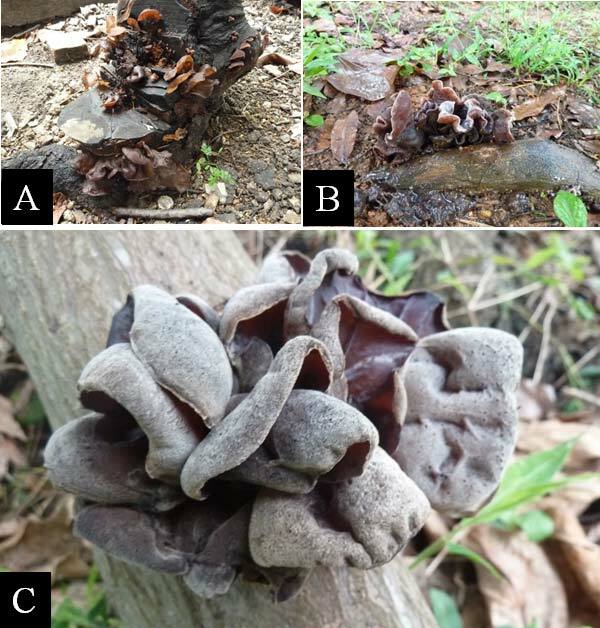 This fungus is mainly found in the tropical and subtropical regions. 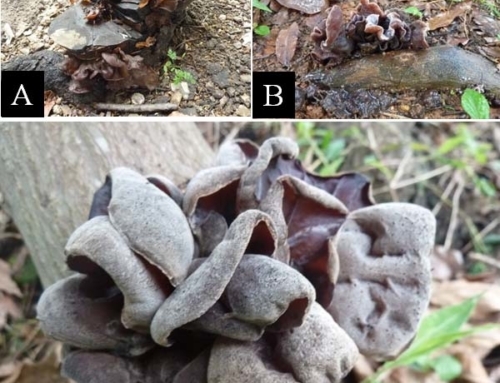 Locally, it is found in broadleaved trees such as Hibiscus tiliaceus etc. 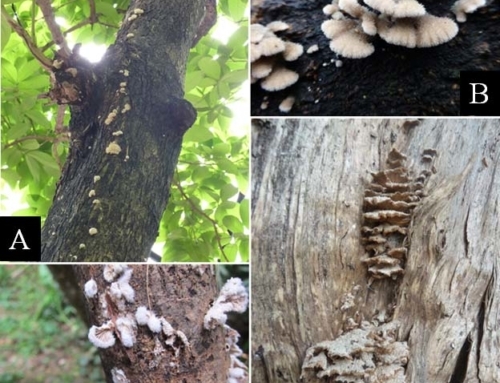 This fungus is found associated with wounds, cavities, dying and dead branches as well as dead trees. 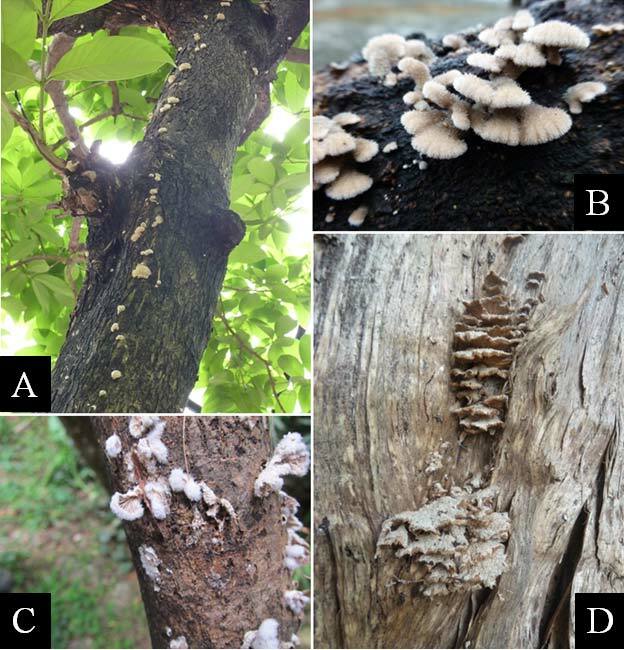 Fresh pruning cuts, exposed wood and dying/dead branches with defoliation are locations to observe for the fungus. 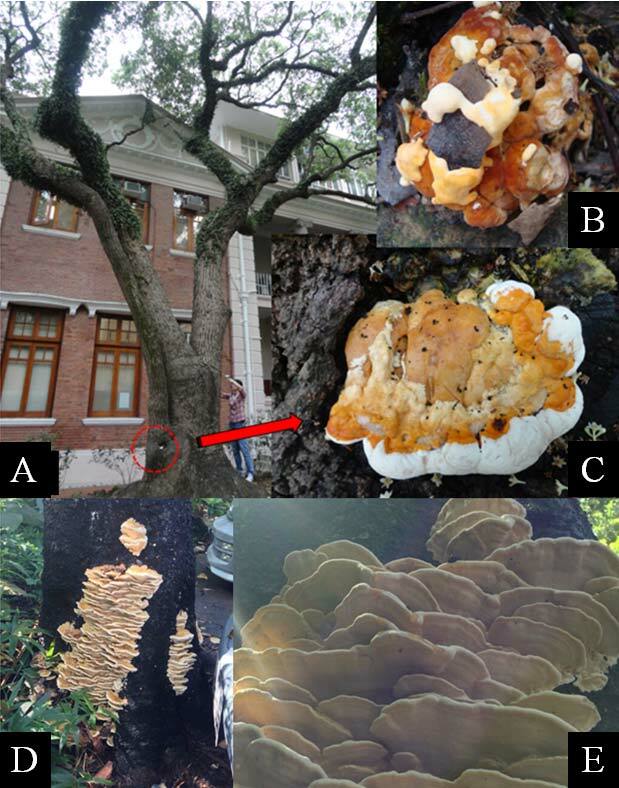 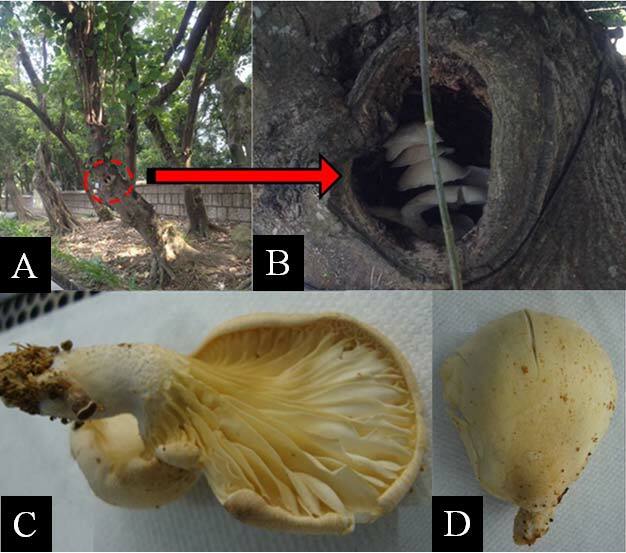 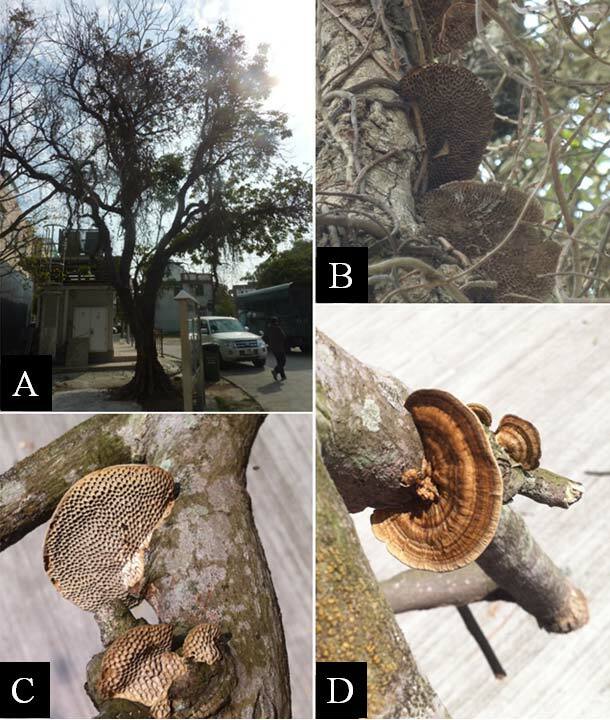 Fruiting bodies serve as obvious sign for the presence of this saprotrophic fungus on trees. 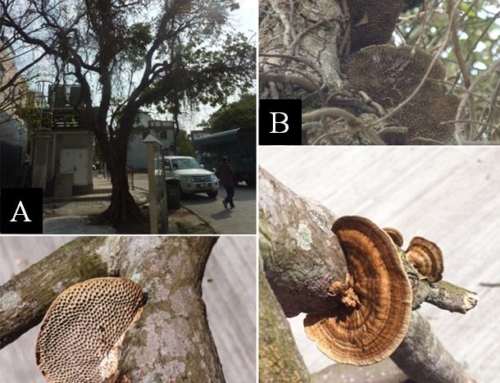 Risk category: Insignificant (GREEN) Though there is insignificant concern on tree health and structural stability due to the presence of this fungus, the trees should be checked for the presence and extent of localised decay in the region where fruiting bodies are observed. 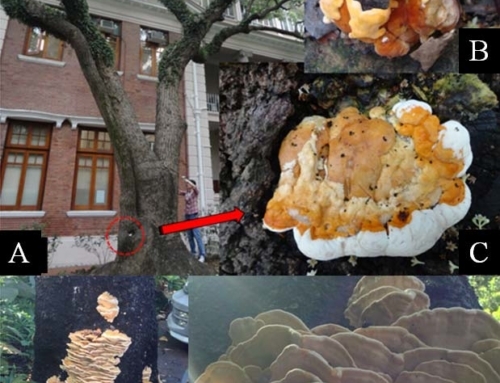 Dead branches and branches with weak attachment observed with sign of this fungus should be removed.